Hi guys! By now the texture polish hype is mostly over, and that makes me quite sad. I really love the look and feel of texture polishes and they are so easy to wear and apply, I would really miss them if every brand stopped making them. Luckily P2 still sells them and even makes new ones. 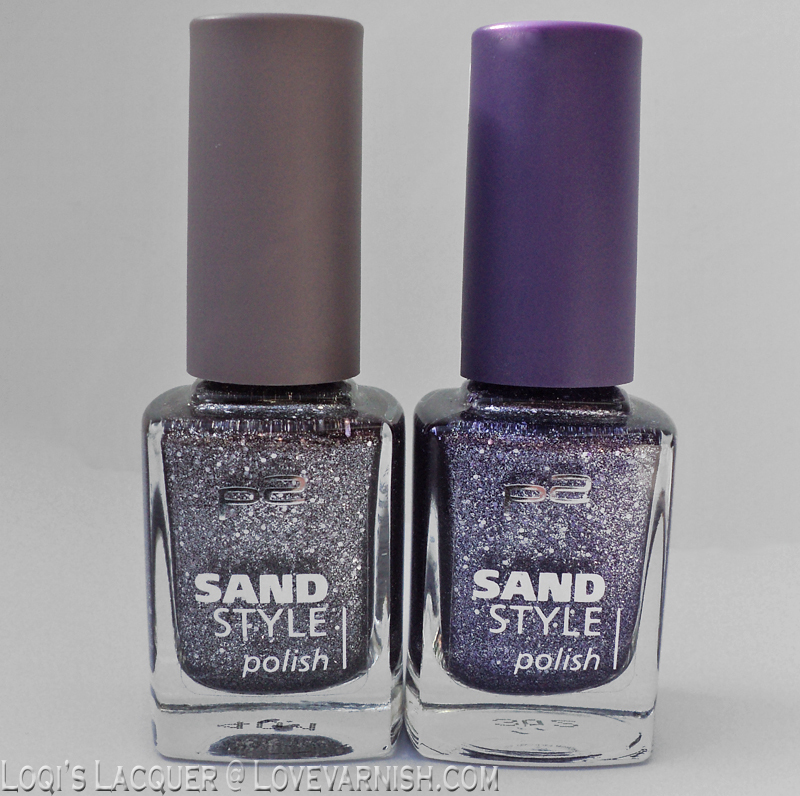 So today I have 2 texture polishes to show: P2 Strict and Lovely. I am going to try to make this hype last as long as I can! Who is with me? Now, P2 is a brand that is not available in the Netherlands, so I have to go to Germany to get their lovely polishes. As such, I don't know exactly when these textures came out. I do know that they are a bit older already, but they are still readily available. Lovely and Strict are part of a larger collection of textures, but these 2 spoke to me the most because they go together very well. 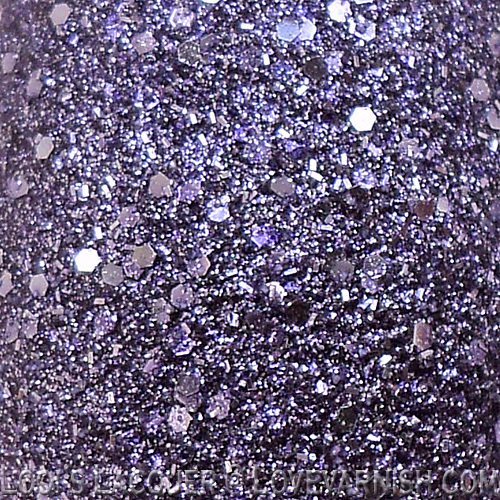 Lovely is a very soft lilac colour with small and medium glitter particles. 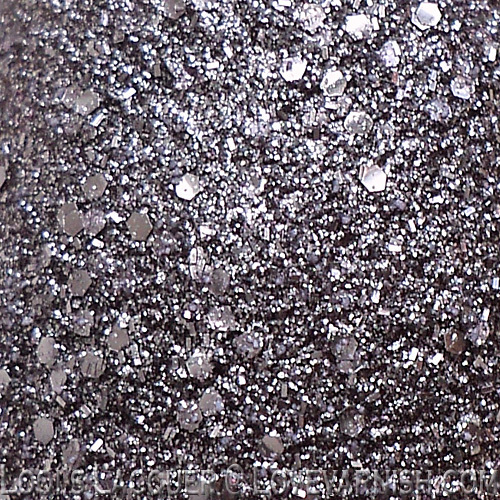 The glitter in these polishes is very matte but still gives the polish an interesting sparkle. I applied 2 coats of Lovely on all my fingers except my ring finger, where I am wearing 2 coats of Strict. Strict is a very interesting colour. As you can see from the small picture to the side, when viewed on it's own its a soft grey, almost charcoal colour with the smallest hint of lilac. But when paired with lovely the lilac takes over and it becomes very hard to call grey any more. Like Lovely, Strict has a mix of small and medium particles. Shown here is 2 coats on all except my ring fingers. I was very impressed with these textures (as I always am with textures from P2). They are easy to apply and dry very fast and they last a good long while too. I really love how these 2 look together and will probably wear them like this often. What do you guys think? Do you like these polishes together? Or do you prefer one over the other? Please let me know in the comments! I hope you guys liked this post and see you next week! I am LOVING these! The texture is so great. Oh I'm totally with you! They're so quick and easy to apply (maybe a bit of a pain to remove, haha) and really add some interest. These are gorgeous! Lovely is lovely! Pun unintended lol. They're gorgeous. I like that the larger pieces of glitter aren't too overwhelming. These are both gorgeous! I am still loving the textured trend and hope it doesn't go away! How, these are seriously gorgeous colors together! LOVE IT! These looks so beautiful! Your swatches always make me want to buy everything! I didn't think I was a texture fan, but looking at your gorgeous nails and these amazing polishes, I'm rethinking my stance! *blush* such kindness, thank you! I just can't separate them, it would make me sad. :D Nothing wrong with a good pun! I agree, removal can be a bit tricky with textures sometimes, but oh so worth it! These are beautiful. I hope texture polishes never go away! Love them. P2 should just be sold here! I hate that it isn't directly available :P.
The colors are beautiful, and the textures are really interesting! Great swatches! These look great together...I really like the color of Strict! 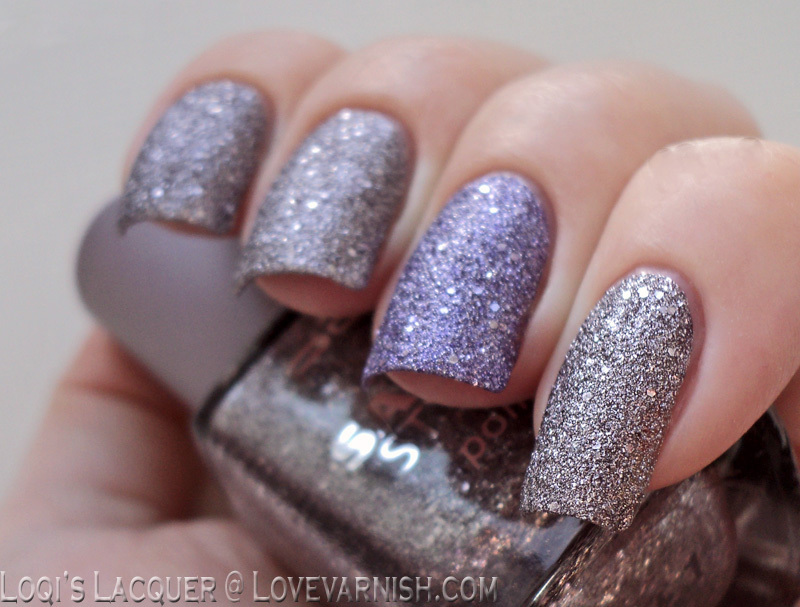 Personally, I've never really loved wearing textured polishes, but they are really pretty! I love tetured polishes! I don't think I will ever get sick of them as long as companies continue to put out ones I must have!! I think the colors are cohesive enough where they look great together!!! I don't normally like textured polishes, but this one is calling my name! Oooh, they're both super pretty, but I love Strict! ooowwwwnn I loved! Wonderful! Kiss for you! Ooh, I love these 2! And yes, I'm still completely and fully embracing the textured polishes, they're just so interesting and fun. So pretty! This is like the style I want Zoya to get back to! I have a weakness for textures and these are super pretty. This is such a cool texture! I have been wanting to try p2 for some time now. Especially the makeup. it's gorgeous on its own and doubly gorgeous together! ack... these are gorgeous. I need to pick some up of this. Love it. So many fans already! I really hope polish companies look at these kinds of discussions! Thanks Dani! Let's hope they keep making them! :D I'm glad I could introduce you to something you liked! Strict is really special isn't she? I think the is winning this round! And so easy to wear and touch up! I agree, I think texture has more potential to stay relevant than crackle did. Yes, their makeup is quite nice as well! They always have really nice eyeliners and pencils in fun colours. Those are totally stunning!!! Love it! Yes I like them together. Actually, I love them together! I love them both and I believe that P2 polishes deserve more love and attention than they get. They have some really great polishes in their range!